HSSC Cancelled Advt. 10/2017 - HSSC Advertisement No. 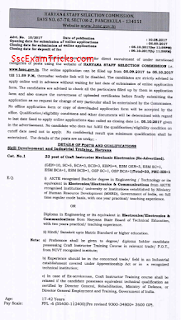 10/2017 Instructor, Craft Instructor, Librarian, Computer Operator Recruitment 2017 - HSSC Advertisement No. 10/2017 Instructor, Craft Instructor, Librarian, Computer Operator Recruitment 2017- HSSC Advertisement No. 10/2017 Instructor, Craft Instructor, Librarian, Computer Operator Admit Card 2017 – www.hssc.gov.in. Latest News (28.04.2018) - This advertisement has gone cancelled. HSSC Latest News - The work of submitting application form has been accomplished successfully. Now, the candidates are waiting for their HSSC Admit card 2017 for Advt. No. 10/2017 on website www.hssc.gov.in. HSSC news from the resources is that Haryana Staff Selection Commission has started planning to schedule written test for the advertised posts. The venue of examination has been decided which may be selected as Karnal, Kurukshetra, Ambala, Panipat and Panchkula districts. The date & time will be finalized very shortly. 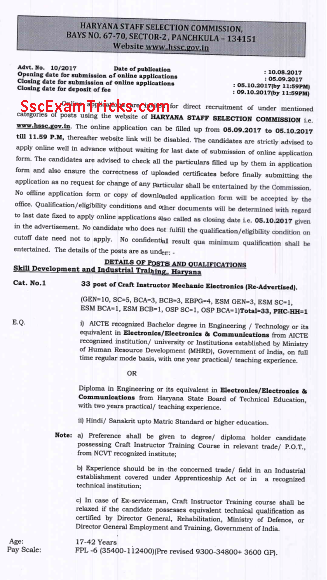 Haryana Staff Selection Commission (HSSC) had released notification and invited applications from 05th September to 05th October 2017 for posts of Instructor, Craft Instructor, Librarian, and Computer Operator. Many candidates are ready to apply for this recruitment and many others have submitted their online application forms on the official website. The final selection will be based on measuring performance in written exam and interview. Haryana Staff Selection Commission (HSSC) will release online Admit card about 15-18 days before written test to be held in 2017 at various centers for the posts of Instructor, Craft Instructor, Librarian, and Computer Operator. Those candidates who had applied for these posts and waiting for their HSSC Advertisement No. 10/2017 Instructor, Craft Instructor, Librarian, Computer Operator Call letter 2017; they can download it from direct link given at the end of the page. Download link for HSSC Admit card/ Result/ Interview Call Letter & Final Result for Advt. No. Cat. No.31 Group Instructor/ Apprenticeship Supervisor/Senior Technical Assistant/ Junior apprenticeship and Placement Officer (Re-Advertised).